 Mouse anti Human CD25 antibody, clone BC96 recognizes the human CD25 cell surface antigen, also known as the Interleukin-2 receptor subunit alpha or TAC antigen. CD25 is derived from a 272 amino acid precursor to yield a 251 amino acid monomeric receptor of ~53kDa which acts as the low affinity receptor for IL-2. CD25 can also form a heterodimer with CD122 to form the high affinity receptor for IL-2. CD25 is expressed by activated lymphocytes (Jackson et al. 1990, Butcher et al. 1990). Defects in CD4+/ CD25+ regulatory T cells have been implicated in the pathogenesis of autoimmune diabetes (Lindley et al. 2005) and other autoimmune conditions (Sakaguchi et al. 1995). Chapel, A. et al. (1992) Differential human immunodeficiency virus expression in CD4+ cloned lymphocytes: from viral latency to replication. J Virol. 66 (6): 3966-70. Ernst, C.W. et al. (2007) Diminished forkhead box P3/CD25 double-positive T regulatory cells are associated with the increased nuclear factor-kappaB ligand (RANKL+) T cells in bone resorption lesion of periodontal disease. Clin Exp Immunol. 148 (2): 271-80. Barberá A et al. (2013) APL-1, an altered peptide ligand derived from human heat-shock protein 60, selectively induces apoptosis in activated CD4+ CD25+ T cells from peripheral blood of rheumatoid arthritis patients. Int Immunopharmacol. 17 (4): 1075-83. Duggleby, R.C. & Madrigal, J.A. (2014) Methods of detection of immune reconstitution and T regulatory cells by flow cytometry. Methods Mol Biol. 1109: 159-86.